The Famous Grouse Highland Blended Scotch Whisky is a popular Whisky available from Tesco Groceries in 1l to buy online. Visit Tesco Groceries for the best price for 1l of The Famous Grouse Highland Blended Scotch Whisky or compare prices on our other Whisky products. Matured in seasoned oak casks. A marriage of finest Scotch whiskies. Blended Scotch whisky. 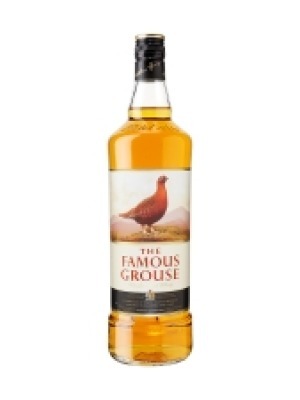 The Famous Grouse is named after the Red Grouse, Scotland's national game bird. Its smooth taste comes from blending fine malt whiskies - including The Macallan and Highland Park - and sweet grain whiskies. And it's Scotland's Favourite Whisky. For some, that would be cause for celebration. For The Famous Grouse, it's simply the reward for a job well done. Cheers. You can buy The Famous Grouse Highland Blended Scotch Whisky online in most retailers and find it in the Whisky aisle in supermarkets but we found the best deals online for The Famous Grouse Highland Blended Scotch Whisky in Tesco Groceries, Waitrose Cellar, DrinkSupermarket.com, and others. Compare the current price of The Famous Grouse Highland Blended Scotch Whisky in 1l size in the table of offers below. Simply click on the button to order The Famous Grouse Highland Blended Scotch Whisky online now.